WHAT TO FEED YOUR KIDS EACH DAY TO KEEP THE WINTER BUGS AWAY? Do your kids catch every bug that goes around or suffer from frequent colds during winter? Do you struggle with finding ways to provide them with a balanced nutrition or want to know how to help them develop healthy eating habits? 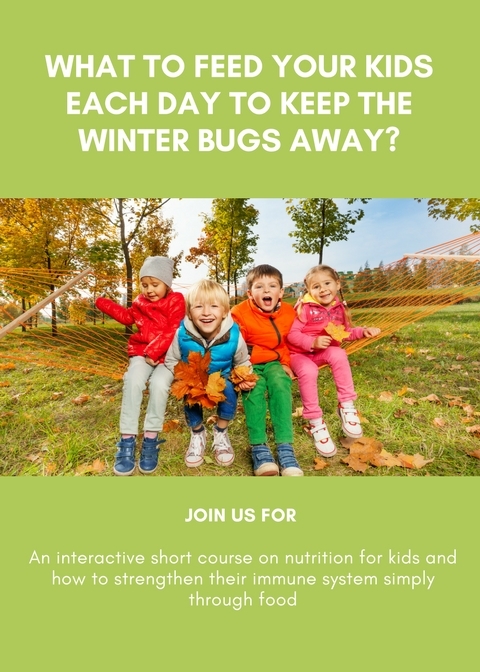 Join us for an upcoming short course on kids' nutrition and learn how to use food to strengthen their immune system before winter. All course participants also receive practical handouts to help you implement the learnings in your daily lives. The course fee is CHF 149 per person. If your kids would benefit from attending the course as well, they are welcome to join at no extra cost (ages 6+ only, please let us know at the time of booking). Bring a friend and receive a 15% discount on the registration fee for both you and your friend (please let us know at the time of booking). All participants receive a life-long 10% discount on all other Nourishi services, including personal nutrition counselling. Please note that due to the interactive format of the course the number of attendees is limited and we would recommend to book your place early to avoid disappointment. To register for the course, please fill in the booking form below. Thank you for registering for our upcoming course/seminar. We will be in touch shortly with further course and payment details and look forward to meeting you in person soon.